NASA's Cassini spacecraft and Deep Space Network have uncovered evidence Saturn's moon Enceladus harbors a large underground ocean of liquid water, furthering scientific interest in the moon as a potential home to extraterrestrial microbes. Researchers theorized the presence of an interior reservoir of water in 2005 when Cassini discovered water vapor and ice spewing from vents near the moon's south pole. The new data provide the first geophysical measurements of the internal structure of Enceladus, consistent with the existence of a hidden ocean inside the moon. Findings from the gravity measurements are in the Friday, April 4 edition of the journal Science. "The way we deduce gravity variations is a concept in physics called the Doppler Effect, the same principle used with a speed-measuring radar gun," said Sami Asmar of NASA's Jet Propulsion Laboratory in Pasadena, Calif., a coauthor of the paper. "As the spacecraft flies by Enceladus, its velocity is perturbed by an amount that depends on variations in the gravity field that we're trying to measure. We see the change in velocity as a change in radio frequency, received at our ground stations here all the way across the solar system." The gravity measurements suggest a large, possibly regional, ocean about 6 miles (10 kilometers) deep, beneath an ice shell about 19 to 25 miles (30 to 40 kilometers) thick. The subsurface ocean evidence supports the inclusion of Enceladus among the most likely places in our solar system to host microbial life. Before Cassini reached Saturn in July 2004, no version of that short list included this icy moon, barely 300 miles (500 kilometers) in diameter. "This then provides one possible story to explain why water is gushing out of these fractures we see at the south pole," said David Stevenson of the California Institute of Technology, Pasadena, one of the paper's co-authors. Cassini has flown near Enceladus 19 times. Three flybys, from 2010 to 2012, yielded precise trajectory measurements. The gravitational tug of a planetary body, such as Enceladus, alters a spacecraft's flight path. Variations in the gravity field, such as those caused by mountains on the surface or differences in underground composition, can be detected as changes in the spacecraft's velocity, measured from Earth. The south pole area has a surface depression that causes a dip in the local tug of gravity. However, the magnitude of the dip is less than expected given the size of the depression, leading researchers to conclude the depression's effect is partially offset by a high-density feature in the region, beneath the surface. "The Cassini gravity measurements show a negative gravity anomaly at the south pole that however is not as large as expected from the deep depression detected by the onboard camera," said the paper's lead author, Luciano Iess of Sapienza University of Rome. "Hence the conclusion that there must be a denser material at depth that compensates the missing mass: very likely liquid water, which is seven percent denser than ice. The magnitude of the anomaly gave us the size of the water reservoir." 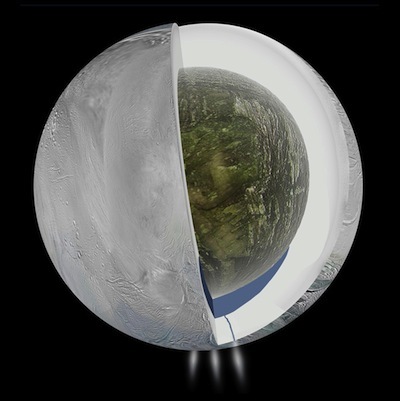 There is no certainty the subsurface ocean supplies the water plume spraying out of surface fractures near the south pole of Enceladus, however, scientists reason it is a real possibility. The fractures may lead down to a part of the moon that is tidally heated by the moon's repeated flexing, as it follows an eccentric orbit around Saturn. Much of the excitement about the Cassini mission's discovery of the Enceladus water plume stems from the possibility that it originates from a wet environment that could be a favorable environment for microbial life. "Material from Enceladus' south polar jets contains salty water and organic molecules, the basic chemical ingredients for life," said Linda Spilker, Cassini's project scientist at JPL. "Their discovery expanded our view of the 'habitable zone' within our solar system and in planetary systems of other stars. This new validation that an ocean of water underlies the jets furthers understanding about this intriguing environment."